Since 2008, Dan has brought a diverse array of professional and academic knowledge into Manhattan Prep’s GMAT classrooms. He establishes an enjoyable rapport with his students and makes the classroom experience fun and productive. He has GMAT scores of 770 and 780. 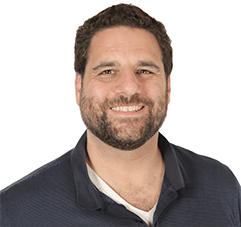 Dan has worked in a variety of capacities in real estate development, finance, and entertainment, most recently as the director of finance for an award-winning artisanal baked goods company in New York. From 2012-2014, Dan was the VP of Business Development for a leading financial services firm that provided solutions to the film and television industries. From 2009-2012, he operated as an independent film and media producer. In this capacity, among other projects, he created and produced a multi-media documentary project about blues music. For the first 30 years of his life, Dan called Chicago his home. There he ran the equities division of a financial trading firm and, before that, was the lead analyst and operations manager for an urban real estate development company. As all of Dan’s students know, he has a passion for the following: coffee, mixed martial arts, dogs, movies, live music and theater, and, of course, teaching. Skyhorse Publishing released Dan’s first book (about the sport of MMA) in January of 2016. Dan holds a B.A. in English and history from Indiana University and an MFA in film producing from the University of Southern California.